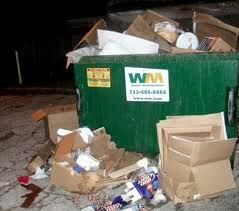 The very thought of crawling into the dumpster behind my house makes me gag. Most of the time, I just chunk my stuff over the top and go on my merry way. A few times, though, I’ve had the pleasure of observing what’s inside. It isn’t pretty. In fact, I’m not sure I want to share details on the leaky bags of filth, dirty diapers, moldy leftovers, and gruesome slime smeared on the sides of the massive garbage container. No amount of urging could persuade me to go digging for my recently thrown thrash. I wonder how many times God’s watched us go back and try to find the inferior things He’s instructed us to throw away. We go digging into the dumpster of our past, choosing to remember rather than forget the things that are behind us. The things behind us could be many things. A colorful past, a broken relationship, a bad habit, or a dream God never intended for us to pursue. Whatever it is, in God’s eyes, those things are trash. They were sent to the dumpster with the rest of the counterfeits, with the intention of never being seen again. Whenever He wants us to send something to the dumpster, it’s to make way for something clean and fresh. The challenge is for us to trust that His new is so much better than our old. If we believe that and press on toward the future He’s mapped out for us, we will reach our prize. It won’t be a bundle of dirty diapers or moldy leftover noodle casserole, either. It will be more like an oasis in a desert.